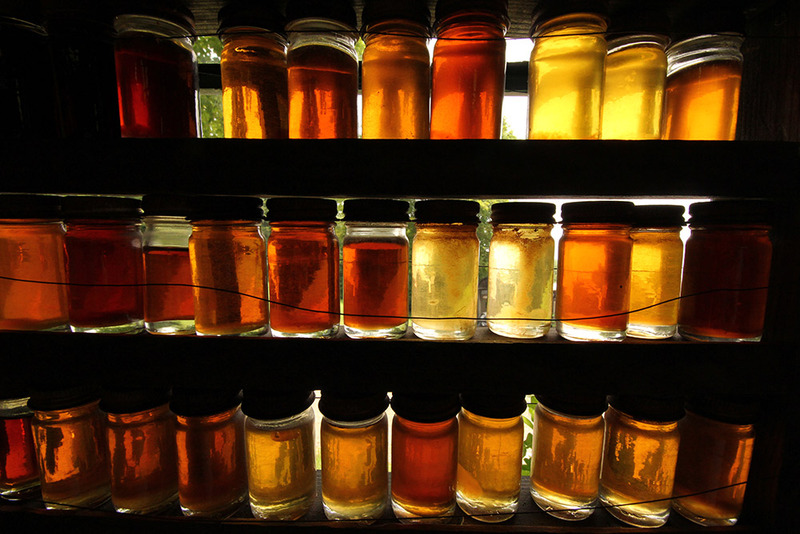 Vermont Maple has been the standard by which all syrups are judged. We think you can taste eight generations of experience in Morse Farm products. Our syrup is 100% pure and natural sweetener rich in minerals (calcium, potassium and iron), vitamins (B2,B5, B6, and niacin), and of course it’s fat-free! What’s the difference between syrup grades? It’s all about the taste! True, there’s a difference in the syrup color between the grades, with lighter syrups being Grade A Golden and Grade A Amber, and darker syrups being Grade A Dark and Grade A Very Dark. However ultimately, taste is what separates the grades, and the best way to decide which to get is to taste them for yourself! We invite you to stop by the Farm to sample them all, although if you’re unable to come the Farm for a taste, purchase our Maple Syrup Grade Sampler or use the chart below which explains the differences between the grades. With the new year comes a new grading system here in Vermont. Below is a chart with the changes. We are always just a phone call away if you need help finding your favorite grade. Grade A – Golden: delightfully delicious, the pale golden color of a late winter’s afternoon, Maple syrup at its finest. Grade A – Amber: (our most popular) distinctive in taste, and golden in color. Grade A – Dark: rich and mellow, with full maple flavor. Grade A – Very Dark: full bodied and hearty, the cook’s favorite.